Is rafting safe in Costa Rica? White water rafting is one of Costa Rica’s most popular tour experiences enjoyed by visitors around the world. 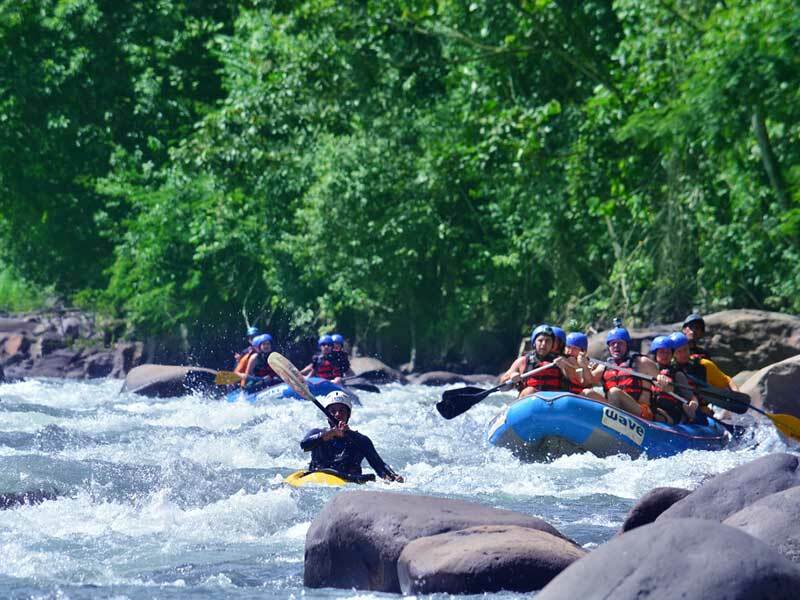 The area of La Fortuna in particular is celebrated as the best area for rafting in Costa Rica because of the its rivers, lush jungle and rainforest climate. Our company, Wave Expeditions, has been rafting for more than 13 years and safety is always our first priority. In this article we’ll explain our stringent safety standards for rafting in La Fortuna so that you can sign up for your rafting trip with confidence. Wave Expeditions offers two choices to our clients when they sign up for rafting: A trip on the Balsa River, a calmer Class 2-3 river with a good mix of action and nature; or the Sarapiqui River, a more advanced, class 3-4 technical ride. You can chose your rafting trip based solely on your desired level of excitement! Both rivers are suitable for all levels of experience, thanks to our highly trained guides and experience on both rivers. The rivers we raft on are controlled by hydroelectric dams. This allows us to know just how much and when water is being released into the river systems. We communicate daily with the dam operators to ensure that we only offer rafting when the water levels are at a safe level. A safety kayaker accompanies every tour, overseeing each raft and is always within paddling distance in case his assistance is needed. Our safety team reviews our maintenance logs daily in order to ensure that all equipment, boats and vehicles are performing at their best. We use high quality equipment and replace it on a regular basis as needed. Our helmets are adjustable to ensure they fit securely and we have kid-size helmets and lifejackets. If it is a chilly day on the water, we provide paddle jackets. Each boat contains a first aid kit and an emergency telephone. The safety team checks weather and water levels on a daily basis to ensure that the rivers are suitable for rafting. If our safety team has any concerns, we reschedule tours or provide full refunds. We launch the boats in our private river entrances to guarantee plenty of room to enter the boats, explain safety procedures and practice paddling. Halfway down the river, each rafting trip stops for a snack of fresh fruit and water to keep energy and fun levels high! We look forward to adding to your wonderful memories of Costa Rica! Pura Vida!